Our vision of creating an office furniture system that would be based on sustainability had to be supported with manufacturing processes that would be ISO 14001 compliant. Our manufacturer obtained registration to ISO 14401: 2004 in the spring of 2005. Earth Friendly, the EVOLVE Office Panel System provides a wide variety of storage components. Pedestal storage, lateral files and storage towers provide a cohesive look. Reducing waste and recycling materials in the manufacturing of our products helps to reduce the impact on our landfill sites. Diverting materials from landfill, reducing waste in our manufacturing and recycling materials within our office environment all contribute to saving and protecting the environment. Our goal is to continue to improve, innovate and ultimately contribute to the protection of our environment. EVOLVE's epoxy powder coating process involves no liquids and is solvent free. It contains no harmful VOC's or lead. Up to 99% of over sprayed powder is reclaimed, mixed with virgin powder and reused. All powder that doesn't get recirculated is recycled and used to paint non-exposed parts. EVOLVE worksurfaces are available in a wide variety of shapes and sizes, permitting a vast array of customized work station configurations. FINALLY . 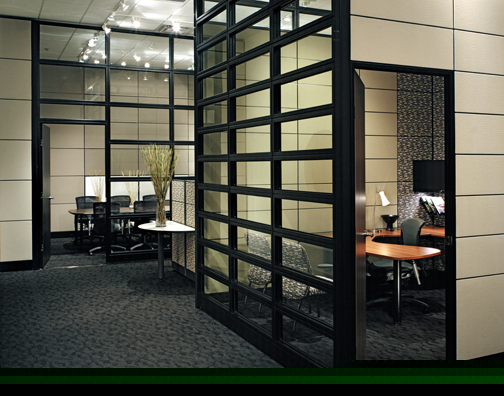 . . the entire EVOLVE Office Panel System is 100% recyclable. Nothing from EVOLVE needs to end up in a landfill.